Here’s a really sweet deal for anyone who plans to book accommodation abroad. Hotels.com celebrates 25 years on the market and released a great £25 off discount coupon code for everyone. 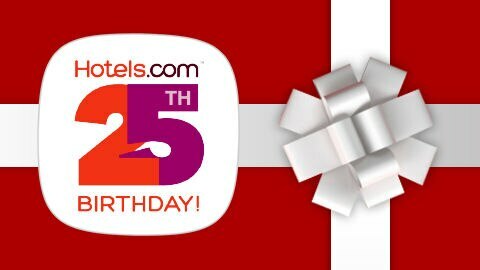 This Hotels.com 25th Birthday discount code is valid only today, 25th April 2016. Minimum purchase necessary to get the discount is £250. Travel dates are limited from 1st June to 31st July 2016. This coupon can only be used on selected hotels in the UK. You may only use this coupon for bookings made until 07/08/2016 on the UK version of Hotels.com for a stay to be completed until 31/12/2016. This promo code works on UK verion of Hotels.com until 26th June 2016 and is valid for stays between 06/06/2016 and 31/01/2017. Hotels.com is a leading online service of hotel accommodation worldwide, offering booking services through its own network of international websites and call centres. Hotels.com gives travellers one of the biggest selections of accommodation online, including both independent and major chain hotels as well as self-catering in more than hundreds of thousands properties worldwide. The company offers a one-stop shopping place for hotel pricing, amenities and availability and also focuses on providing travellers with accommodation during sold-out periods. Hurry up and book your discounted hotel stay with Hotels.com!